This book is unique and contains discussions, which cannot be found in most of the textbooks. Topic will range from: detailed and full explanations for vocabularies, grammatical particles, expressions (colloquial and idioms), difference between similar vocabulary (why to use this word and not that word) and more. Humorous pictures to add visual understanding accompany most of the vocabulary and expressions. Then the material is followed with many examples to let the student get the feeling of the words and expressions. The Chinese parts in the book are written in the Chinese simplified characters followed by pinyin, and the explanations are all in English. The information about every grammatical particle is comprehensive and not partial as in most of the textbooks. The only way to gain the knowledge and insights contained in this book is by extensive private studying with a native outstanding Chinese teacher. This guide is a result of Orna`s long-term learning experience. Being a Chinese language student, she understands the needs, the difficulties, and the mistakes a student tends to make when studying Chinese. 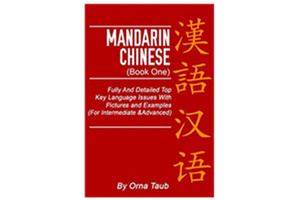 In light of this along with her passion and interest in Mandarin Chinese, she wrote this book for Chinese learners in hopes that it will help you progress in your Chinese language studies. Other than “textbook”, we`d love to call it as a Mandarin Chinese knowledge notebook. This book is not a textbook to consistently learn Chinese, but it is a book to base and enrich the mastery of the language. The material is a general selected summary for this targeted language.